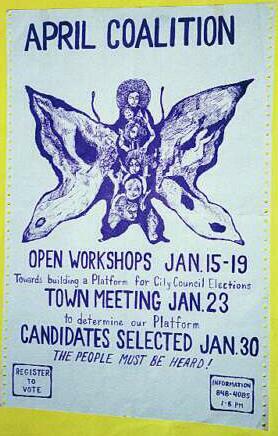 A silk screened, long-haired, hippie butterfly poster represented the counter-culture community that was very active in the 1971 April Coalition. This poster was an invitation to help develop a community platform, which turned out so extreme that electoral people tried to destroy all copies. The April Coalition platform was used by the conservatives to attack April Coalition candidates.